One of the most requested features for Apple's MacBook Pro line has been for the integration of some sort of built-in 3G cellular data to allow for anywhere wireless connectivity. MacBook Pro users presently need to purchase a separate Mi-Fi or 3G USB Modem in order to keep their machines connected to the internet when not near a Wi-Fi hotspot. 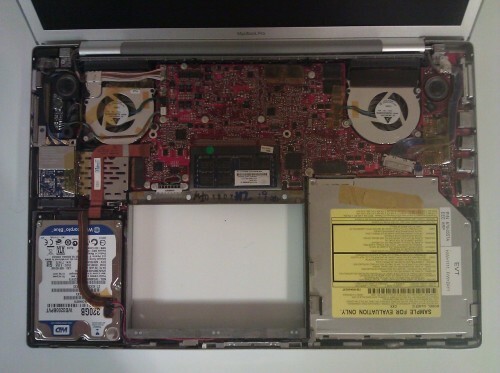 Apple has developed prototypes of the MacBook Pro with integrated 3G data, as evidenced by this eBay sale showing a never-released MacBook Pro prototype. Upon removing the top case it was immediately clear this was no normal Macbook Pro: the circuit boards inside were bright red as opposed to the normal blue! Further inspection found multiple differences from the stock version, most notably a feature never seen in a Macbook laptop of any kind: what appears to be a fully integrated cellular modem and SIM slot. 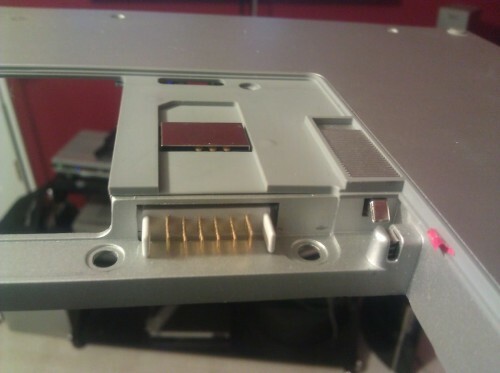 There is an extendable cellular antenna located at the right top side of the display assembly (The antenna is marked with "Tyco Proto / #006" when slid out), and a standard size SIM card slot located underneath the memory cover on the bottom of the machine. The SIM card board is connected to the logic board via a connector not found on production machines. The solder footprint for it is still present on the production boards and not populated, which is interesting. This would seem to suggest that it was a last minute decision to remove the cellular functionality before going into mass production. The optical drive is marked as a "Sample for Evaluation". Rather than a normal EMC Number the specifications lapel simply says "XXXX", and the serial number does not show up in Apple's online database. The seller was able to repair the machine to get it into working condition. The 3G connector is seen by the operating system, but the actual data connection is not presently functional. The auction is, of course, sold "as is" but for our purposes, the existence of such a machine is the most interesting aspect. The laptop carries a red motherboard which is typical of Apple prototypes. We've seen this in other prototype machines that have leaked out of Apple before: prototype Mac Pro and prototype iPod touch. The seller also notes that the remnants of the SIM-card connectivity remain on the production motherboards but are not populated. It's not clear at what stage Apple decided not to pursue production of this model. The integrated SIM card shown above means Apple had used GSM 3G technology rather than CDMA, allowing for use on AT&T and many other international networks. The 3G card itself is identified as a Dynastream ANT2USB stick according to OS X. 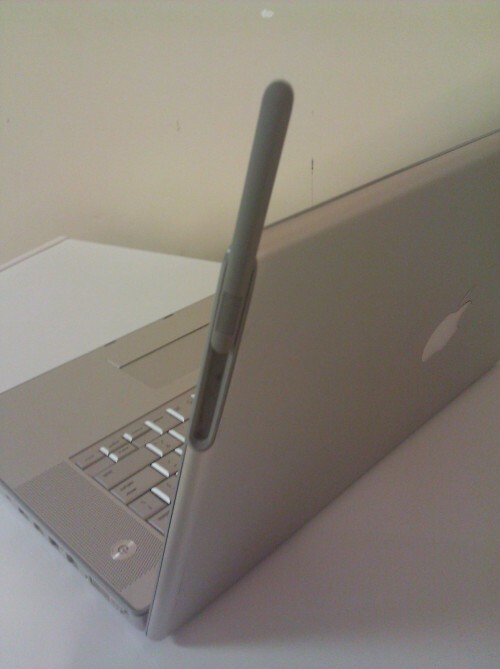 In the prototype, Apple integrated the 3G antenna as an extendable antenna along the right side of the lid. Apple has yet to produce such a machine with integrated 3G, but has clearly been working on possibility since as far back as 2007. Update: "ANT" referenced in the Dyanstream ANT2USB is a low power 2.4GHz wireless protocol closer to Bluetooth than to 3G data, though that doesn't explain away the presence of a SIM slot and large antenna. Update 2: The auction has been pulled, presumably due to a complaint by Apple. Its a prototype never meant to be seen from 2007 ?? definitely shows its age haha, remember when all the cell phones had those antennas? Cool at least they have experimented with it. Hopefully this will become common on pro's or the air more especially in the future. Lol. I actually don't think it's a bad design. Just needs some updating for the current models. It's an innovative placement and I've never seen another machine like that, though one possibly exists. It seems kind of like the OLPC bunny ears but far less obnoxious. This would be a welcome addition to my future MBP purchases. Especially if I could keep the service separate from my current contract and activate it only when needed. On a related note, doesn't Apple usually have eBay take down legit listings like this? Well.....Does the 3G work? Tell us man!!!! That antenna is a hell of a lot better looking than having a huge USB 3g data stick jutting out of the side. They probably thought, we can't put 3G in a MacBook before we but 3G in the iPhone! Plus, Jobs would never approve that antenna. Now this is becoming less and less relevant with WiFi hotspots on phones. Wow, I must admit I really didn't expect so much insanity over this listing and I almost don't want to post in this thread! Honestly I think most of this stuff about the antenna looking bad is due to the angle I took the picture at. It looks rather huge. In reality it is quite tiny, it only protrudes about 2" from the display when extended and is maybe a millimeter or two thick. I'll answer questions if anybody has them, just please don't go too crazy. Tomorrow it goes into a safe deposit box and likely stays there until the auction is over. 3G was already in many laptops in 2007. And many many others. 2007 is when it started to be common place for computers to have 3G built in not, "from 2007, before 3g was in like...any laptops"
Apple is definitely lagging behind when it comes to 3G laptops, but I'm sure when they do it they'll do it right.